Is it really hard? This maybe the question that you have in your mind right now, as you prepare for the NCLEX EXAM. But before we actually dig deeper into that question, let’s take a look at the statistics. 74.84% of all NCLEX RN Examiner between January and June of 2017 PASSED. It means only 1 out of 4 Nurses failed the exam. So don’t freak out, you have a high chance of passing. Here’s another stat, 88.4% of EXAMINER who were educated in the US passed during the same period. It means 9 out 10 passed the NCLEX RN. That’s a great feeling of relief indeed. But the thing is everyone has a different definition of “Hard” and “EASY”. So let’s go back to the question, HOW HARD IS THE NCLEX EXAM? The Answer is HARD, but not impossible. Nursing is a big profession. The Health Resources Services Administration reports that 3.1 million nurses are currently licensed in the U.S. Nursing school has given you a great foundation for NCLEX success. All the things you have learned althroughout nursing program has built a wide range of knowledge that will help you provide safe nursing care. You will be asked questions that require you to use this knowledge and analyze patient situations and complex information as a way to demonstrate your ability to meet the competency standards of a new, entry level nurse. Being familiar with what you have learned during the whole nursing program and how the test works will go a long way in helping you prepare. 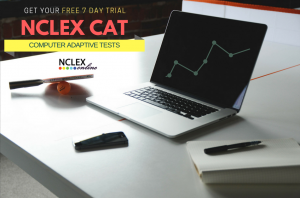 One of the unique things about NCLEX is the use of Computer Adaptive Testing. This means that the test is tailored measure your ability level. The computer will use your answer from a previous question to adjust the difficulty of the next question to get an assessment of your true ability. The computer needs to be certain within a 95% confidence interval that you can answer medium difficulty questions right at least 50% of the time. In other words, the questions might seem difficult because the computer is aiming to give you questions that you have a 50% chance of getting right so it can determine your score. If you are familiar with the Computer Adaptive Testing style, your chances of passing the NCLEX Exam will definitely be higher than those who are not.